We used the KW1 assembled genome (in the github repository at chalara_fraxinea/Kenninghall_wood_KW1/assemblies/Chalara_fraxinea_TGAC_s1v1_contigs.fa), which was assembled from reads generated from genomic DNA extracted from a cultured isolate from Kenninghall Wood in the UK. We collated the partial sequences of SLA2 and APN2 proteins that likely flank the mating locus and the MAT1-1-3 and MAT1-2-1 proteins that have been identified in H. pseudoalbicans and used these in a tblastn against the KW1 assembled contigs (with default settings). Further details on the H. pseudoalbidus MAT locus can be found in Gross et al., 2012. The tblastn search highlighted a single contig that contained the SLA2, APN2 and MAT1-1-3 genes. The output can be found in the github repository (chalara_fraxinea/Kenninghall_wood_KW1/blasts/blast_MAT_locus_elements). This suggests the KW1 C. fraxinea isolate is of the MAT1-1 mating type. 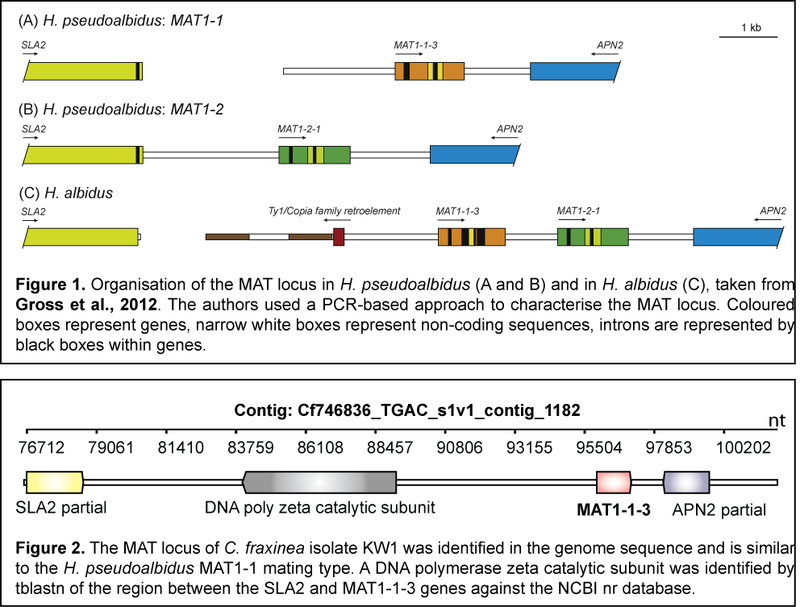 The sequence between the SLA2 and MAT1-1-3 genes was then extracted and used in a blastx search against the NCBI nr database. This analysis identified a region with similarity to a DNA polymerase zeta catalytic subunit. Gross A., Zaffarano P.L., Duo A., Grunig C.R. (2012) Reproductive mode and life cycle of the ash dieback pathogen Hymenoscyphus pseudoalbicans. Fungal Genetics and Biology 49, 977-986.